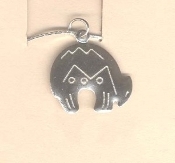 Zuni SPIRIT BEAR PENDANT NECKLACE - Native-American Indian theme silver-tone engraved Metal charm, approx. 1-inch (2.5cm) long on 18-inch neck chain with safety clasp. Native American legends tell of magical spirits that dwell within the forms of small carved animals. Of these, one of the most powerful is the Bear. Strength and Well-Being are yours!